Milan have had a really tough season but lately the team seems to have turned a corner. In fact, after Sunday’s impressive win against Lazio, Milan have now won three games in a row. It seems Gennaro Gattuso is doing some really good work at the club at the minute. To beat Lazio was impressive, but in all honesty three points weren’t really deserved. First of all, Lazio were the better side over 90 minutes and second of all, Milan’s opener was scored by Patrick Cutrone using his arm to steer the ball into the net. Lazio then created several good chances in the second half but Milan managed to keep them out and earn a 2-1 win. Gattuso won’t care though, because his side won and performed well. The game brought some intriguing tactics from both sides, in particular Milan’s defending and Lazio’s way to beat Milan’s press. Gattuso set up with a 4-3-3 where Gianluigi Donnarumma was in goal, Davide Calabria, Leonardo Bonucci, Alessio Romagnoli and Luca Antonelli in defense, Franck Kessie, Lucas Biglia and Giacomo Bonaventura in midfield and Suso, Cutrone and Hakan Calhanoglu in attack. Simone Inzaghi had to do without Ciro Immobile, scorer of three goals when the side’s met in Rome, and chose Felipe Caicedo up front with Luis Alberto just behind him. Behind those two, Lazio had Thomas Strakosha in goal, Bastos, Stefan De Vrij and Stefan Radu in defense and Adam Marusic and Senad Lulic as wing-backs either side of the midfield trio of Marco Parolo, Lucas Leiva and Sergej Milinkovic-Savic in their 3-5-1-1. Gattuso had some interesting ideas in terms of the way his Milan side defended against Lazio. The nature of Lazio’s formation is that they have maximum width at all times thanks to their full-backs, a centre-forward who stretches the opposition vertically and four central midfielders looking to exploit gaps centrally and dominate midfield. Gattuso wanted Milan to steer Lazio into wide areas and press the wing-backs, but he didn’t want to press the back-three with his front three. Instead, he had both wingers play rather defensive roles against Lazio’s wing-backs while the ball-near central midfielder would leave the midfield and press Lazio’s wide centre-back in possession while Cutrone pressed De Vrij (the central centre-back) while also covering Leiva. Below is an example as Bonaventura leaves midfield to press Bastos while Calhanoglu stays central as long as possible to prevent a central pass into the space behind Bonaventura. If the ball goes wide to the wing-back Marusic then Calhanoglu will press him. Below we see it again. Kessie has pushed out of midfield to press Radu while Suso stays central until the ball is played wide to Lulic. As soon as the ball is played towards Bastos here (below), Bonaventura starts the press while Calhanoglu again stays central to prevent an easy pass into the space behind his teammate. The knock-on effect this had for Milan’s full-backs is highlighted below. Lulic has received the ball and Suso presses him. This leaves Calabria in a covering position behind the winger and gives him the possibility to press Milinkovic-Savic in the centre if the ball is played into him. This was an interesting way to deal with Lazio’s wing-backs. On occasions when Lazio changed side quickly it could leave Milan with a situational back-six but most importantly it gave protection to Suso and Calhanoglu when they went to press. Given neither are defensive masters and were beaten by dribbling from the two Balkan wing-backs in blue, the protection was necessary. 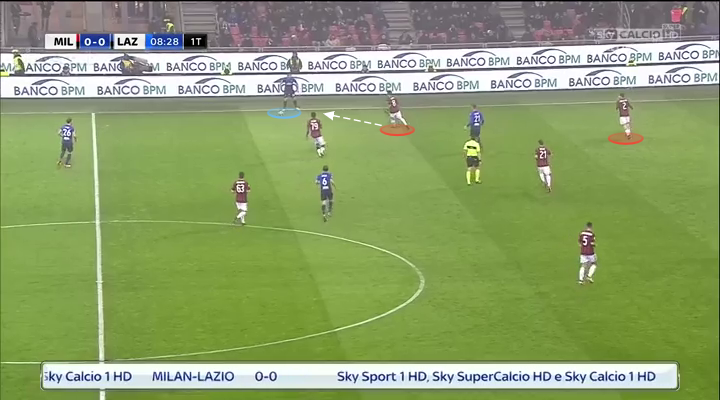 If Gattuso had pressed the back-three with his front three then it would probably have meant Milan’s full-backs would have had to press the wing-backs of Lazio, leaving Milan more vulnerable, exposed and without protection for the pressers. Milan also used Cutrone to limit the influence of Lucas Leiva. Cutrone would always start just in front of the Brazilian and then look to angle his press against De Vrij to simultaneously block Leiva. This worked very well. Granted, Leiva could simply have moved out of Cutrone’s shadow, but he rarely did and was replaced early in the second half. 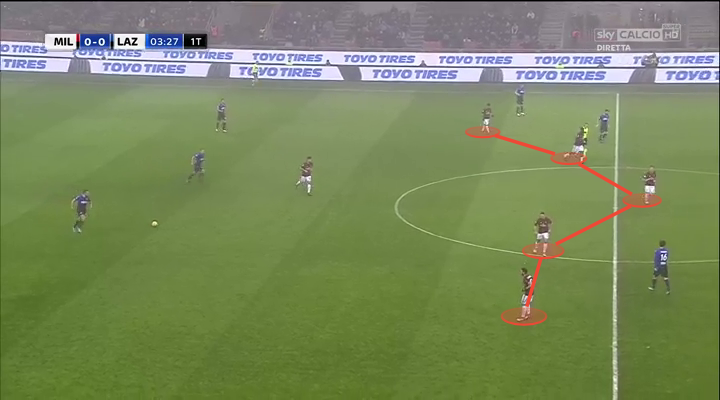 When Milan couldn’t press or the press failed, they moved into a compact mid-block 4-5-1 as can be seen below. The focus was always on limiting the influence of Lazio’s central midfielders, but as we’ll see, Lazio had some ways around that. Lazio lost the game and weren’t at their best, but they still played well enough to at least secure a point given the chances they had. They moved the ball very well and often managed to beat Milan’s press when they tried to press Lazio high. For long spells in the first half, Lazio did however struggle to utilize their wing-backs because of the clever pressing Milan used which was discussed above. Space was also limited in the centre of the pitch, but Lazio found ways around Milan’s compact midfield to exploit space between the lines of Milan’s defense and midfield. This was mainly achieved by third man combinations and “bounce passes” where the ball was chipped in over Milan’s midfield to one of the strikers and who then laid it off to an onrushing midfielder. Mostly these passes were in the air, often from Lulic, but on other occasions we saw slick third man combinations down the ground. Below, Leiva threads a pass through Milan’s midfield to Caicedo who then instantly lays it off to Parolo. This image below is just before Lazio’s equaliser. Lulic chips the ball into Luis Alberto who lays it off to Leiva who then sprays the ball wide to Marusic. Marusic beats Antonelli, cuts in on his left and places the ball out of the reach of Donnarumma. Combinations of this kind are so quick and surprising that they prevent the opposition to get back into their shape. Therefore this helped Lazio create space both in wide areas like with the goal and also between the lines as the first example showed. Lazio also impressed in their calmness when playing out from the back. Milan tried to press them from goal kicks but Lazio never hesitated or doubted their ability to play out. Below is one of those examples. De Vrij is on the ball in the left corner. He’s got Radu to his left, Lulic further up the left wing and Milinkovic-Savic in a straight line in front of him. Milan have pushed up with their entire front six but become hesitant. Firstly, Suso doesn’t know whether he should press De Vrij or mark Radu. Kessie is caught in confusion between marking Lulic on the wing, pushing up against Radu or marking Milinkovic-Savic in the middle. In the end he goes with Lulic and Biglia decides to drop off, allowing De Vrij to exchange a pass with Radu before finding Milinkovic-Savic who then turns the play and progresses down the right. This was just one example but it showed Lazio’s calmness when playing out of a high press and also Milan’s poor attempts at pressing high. The movement and rotations of Lazio’s players caused confusion among the Milan players, but with more time under Gattuso they might improve in this regard. Milan didn’t only defend; they actually played some really good stuff at times in the first half. Especially impressive was their rotations between Suso/Kessie and Calhanoglu/Bonaventura and the clever movement of these players. In the first example, Suso (red) has picked up a pass from Bonucci in the right half-space. This space has opened up because of Kessie’s movement towards the right wing which prevents Radu from following Suso inside. Also note Calhanoglu’s central positioning between the lines; he’s drifted inside from the left, something he did continuously throughout the game. One area Milan had clearly identified as a weakness for Lazio was the space behind Parolo. As Parolo always presses the opposition left-back, in contrast to how Lazio pressed on the left where Milinkovic-Savic stayed centrally and Lulic pressed the right-back, he would also leave space centrally behind him. If Leiva weren’t quick across to cover, that space would be huge. Below is an example of the space that opens up. On multiple occasions, Milan managed to find Calhanoglu or Bonaventura in this space and especially the Turk had three or four shots from that space. Milan were clever in dragging Parolo out of position also when he didn’t press the left-back Antonelli. Here Bonaventura drags him out of possession and opens up a huge space between the Italian and Leiva which the Brazilian struggles to cover. Calhanoglu comes inside, receives Romagnoli’s pass and can attack. Finally, let’s look at the winning goal. Milan have switched the play and the ball has come to Calabria who crosses from the right. I’ve highlighted the duel between Cutrone and Bastos. Cutrone attracts the Brazilian and drags him with himself and that opens up space for Bonaventura who makes a run into the empty space and heads the ball in to win the game for Milan. In an even game where Lazio might have been the better side over 90 minutes, Milan took the three points. The game was surrounded by controversy because of Cutrone’s handled opener, but Milan will be really pleased with the win and their form. Gattuso has brought energy and hard work to the side and this performance had energy and work rate in abundance from the home players. The future all of a sudden looks much brighter than a month ago. For Lazio, the loss was probably tough to take but Inzaghi’s men have been sublime throughout the season so far and will continue to challenge for third place.